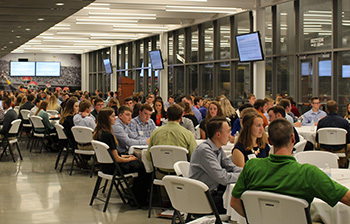 The goal of the event is to let students network with representatives in a casual setting to better prepare them for Career Day the following day. Students can talk to representatives one on one and build their professional network. Four 15-minute sessions allow students and reps to discuss topics including resumes, interviews, elevator speeches, and company culture.